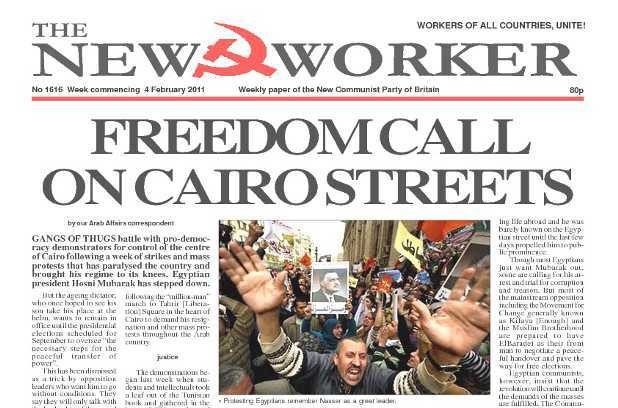 www.newworker.org | 4th February 2011 - Freedom call on Cairo streets - Bye Bye Mubarak. Back down on public sector pensions. GANGS OF THUGS battle with pro-democracy demonstrators for control of the centre of Cairo following a week of strikes and mass protests that has paralysed the country and brought his regime to its knees. Egyptian president Hosni Mubarak has stepped down. THE CON-DEM Coalition last week announced that it would not be introducing major changes to public sector pensions in the Budget this March, saying it would not have the detailed proposals ready until the summer. FIRST Tunisia. Now Egypt. Arab tyrants are going down like ninepins as the masses raise the flag of liberty on the streets of Cairo, Alexandria and across the Nile Delta. The Mubarak regime is trying to cling to power but few believe it can even see the week out.